The challenge I’ve set myself for June is to simplify my life and streamline everything about it. One of the pivotal activities for this challenge is clearing the clutter from my house and my life. Clearing the clutter from my house is well overdue. I’m hoping that as the physical clutter diminishes, the emotional clutter will begin to disappear, too. Getting rid of the stuff you don’t need, don’t like and basically can’t stand looking at any longer is liberating. In fact, it’s downright cathartic. Sometimes, though, we hold onto stuff for totally crazy reasons. For example, in the utensil holder in my kitchen is a flower picture holder. It came home from kindergarten with my daughter – a mother’s day gift 15 years ago. It’s wooden, is creatively painted, sits on a long stem (which is why it found its way to the utensil holder) and contains a hand drawn picture of… either me or her, I never had the heart to ask. The thing is, I have a real problem getting rid of it. Am I a bad mother if I toss this piece of her childhood in the bin? Is it really a piece of her childhood? Does she even remember making it? Or is it something she brought home and never thought about again? As if there aren’t enough reasons for motherhood guilt! I still haven’t come to a conclusion regarding the flower frame. That might have to be one of the last things about which I make a toss or keep decision. It still has too much power over me. The flower frame is just one of many such items still exerting their power over me. So, clearing the clutter is probably more of an emotional challenge than a physical one. I guess I wont really know until I get stuck into the job. I get the feeling I’ll be spending a fair bit of time in the garage this weekend, sorting and tossing, and probably re-sorting and tossing again or maybe not tossing. In some ways I’m looking forward to clearing the clutter but I’m also aware of how confronting it could prove. And that’s just thinking about my daughter’s belongings and assorted school projects. I’m really dreading figuring out what to do with my dad’s stuff… It ended up in my garage when my parents moved but unfortunately my dad became ill soon after and never managed to get back to sort out what to keep and what to toss. That’s a task I’m dreading and you can be guaranteed I’ll to tackle all on its own, on a quiet day and I’ll probably need a stiff drink afterward. Do you struggle with the guilt of getting rid of items given to you by your children, or loved ones in general? How do you handle it? Hubs on the other hand keeps old tv’s (10 yr plus old!) Why you ask?? “In case the tv dies!” He doesn’t want to wait 3 days until a new one gets delivered!!! Go figure, lol. Also in the category are denim jeans sized 38 waist in case he loses weight. BTW, he is 44-46 waist now! SHM. How I deal, with a smile because it’s not worth the effort to be logical with him! Confession: I have an old (working) TV in the garage AND a few pairs of jeans that are smaller than I am now. But… I’ve put the jeans in a ‘limbo box’ and if the stuff in the box doesn’t fit again within 12 months it will be donated. So, the clock is ticking. You’ve reminded me I have a shopping bag full of packets of photos. Oh, what joys I have to look forward to! 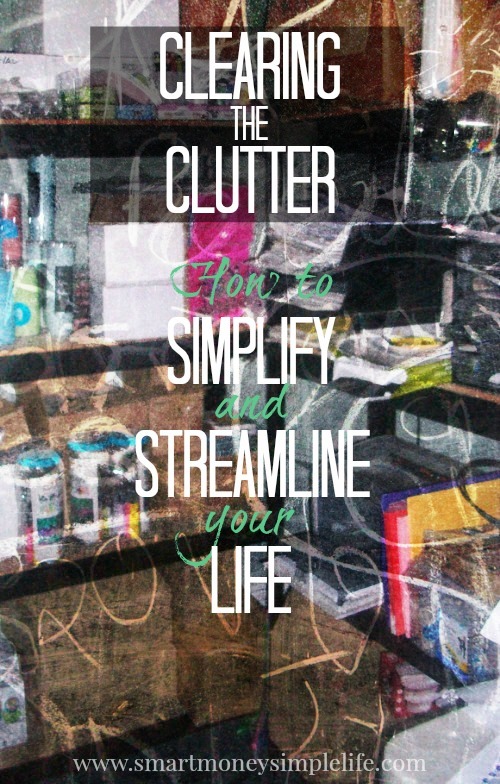 Totally agree that physical and mental clutter go hand in hand. Doing a good clean out can really help both areas. One tip I remember reading about was to take pictures of sentimental items that you’re struggling to get rid of. Sometimes its just the memory that we want to keep. Taking a picture will help keep the memory alive but let you get rid of that piece of clutter.